We normally try to complete all fall seeding by Halloween each year. This year, it has rained so much, that we will not finish until early November. Seed will germinate each year through the entire month of November and into early December. The downside to late seed germination is that the soil temps are colder and the seedlings often do not reach their full growing height until spring. Once the soil temps drop below 50, most top growth will cease(AKA this is why mowing is not needed in the winter). The good news is that the new grass will develop roots over the winter and will be strong and robust next spring. Therefore, your grass will be shorter on top the later it is planted each fall, but gives the same end result in spring, once top growth resumes. Seed germination has required no irrigation this year! Once new new grass has germinated, please DO NOT ALLOW anyone to mow it unless the ground is dry. We have had several customers already this year who have allowed their mowing companies to resume mowing on wet soil. This crushes the new seedlings and kills them when the mowers slide across the wet ground! It is ok to let leaves remain on grass seed. However, once the seed germinates, leaves should be blown off within one week of seed germination so they seedlings won’t smother. DO NOT rake leaves on new grass. I love rain, but give me a break already!!!!!!!!!!!!!!!!!!!!!!!!!!!!!!!!!! There is a new granular fungicide for homeowners that works almost as good as Heritage Granular, but costs a little less. It is call Disarm G. It is in the same fungicide family as Heritage G. (Strobulins). Great fungicide, but it still ain’t cheap!!!!!!! Check Dickens Supply or Sigma Organics for this product. Yellow Nutsedge – A warm season perennial plant that looks like yellow grass, but is actually a sedge. It emerges in poorly drained areas or areas that irrigate too frequently!!! Light frequent irrigation makes nutsedge problems 90% worse than deep, infrequent irrigation!! If you get several thunderstorms during May, nutsedge is inevitable. Since it is a perennial, crabgrass pre-emergent has no effect on nutsedge. There are two decent herbicides that (IF APPLIED PROPERLY) can control nutsedge. They are Sedgehammer or Dismiss. Dismiss is the newer and better herbicide. It controls nutsedge often with one application where as Sedgehammer always takes at least two apps. Make sure to follow the label with all herbicides! 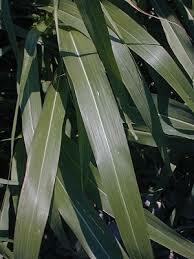 Dismiss will stunt desirable grasses for up to a year or kill them if over applied. We spot treat for nutsedge during third app each year and every time we apply preventative fungicide. Nutsedge tends to keep germinating in the same spots every year, all summer long. DO NOT pull it out of the ground. This often leaves the “nut” in the soil and causes rapid proliferation of more sedge. it is like pruning a shrub, it stimulates rapid growth!! if you do pull it, make sure you get the whole plant!!! 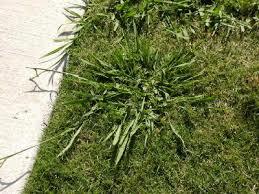 These weeds are mostly mistaken for crabgrass. They look like crabgrass on steroids. They are in fact quite different than crabgrass! They both are warm season perennials and crabgrass is a summer annual. This means crabgrass dies every fall after the first frost. Johnsongrass and Dallisgrass do not die after the first frost, however, the top foliage disappears after the first frost. When April arrives, the plants put out new top growth from the rhizome underground. The top left photo, shows a johnsongrass rhizome. Therefore, crabgrass pre-emergent does nothing to deter these perennial grasses. Pre-emergent only keeps annual plants that germinate from seed(crabgrass) from emerging. There is NO selective herbicide that will kill these grasses without killing your desirable grasses. Therefore, the best time to control these grasses is at the end of the summer, right before overseeding time. Roundup or Fusilade should be applied twice, ten days apart for best results. The BEST control method is a shovel!! The rhizome is very difficult to kill, even with Roundup or Fusilade. Therefore, digging them out is the best method. If you have several of these plants in close proximity, they are most likely connected by the rhizome underground. If you spray 10 of these plants with either Roundup or Fusilade, 7 will not return in the same spot the following April, but up to three may remain. If you choose to spray these grasses instead of digging them up, be prepared to take 3 summers for 100% control. What a pain!! Why do I get these??? Surface soil moisture is the key. A poorly drained soil or light, frequent irrigation makes these grasses go crazy. See irr 101 to correct bad irr habits. To improve drainage, aerate every fall. We typically treat these grasses during 4th app in late July or August. If you do not want the dead brown spots that accompany the killing of these grasses, please let us know prior to 4th app!!! 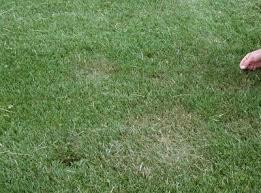 “Brown Patch” fungus is the number one fungus problem on cool season lawns in TN!!!!!!!!! Causes: Heat + Humidity+Moist leaves. It is very similar to athletes foot on grass! It generally begins about late May and can be active thru late August. It requires 60 degree nights to remain active. Right now, in early June 09, it is in high gear!!! Symptoms: Brown circles from coffee cup size to over three feet in diameter, with most common size about dinner plate size. When observed early in the morning, before dew dries, a grey”smoke” ring will appear in the outer rim of the circle. This ring means the fungus is actively spreading and damaging turf. Chemical control – Fungicide is expensive! It requires half of the fungicide to prevent fungus as it does to stop it. Therefore, it is smarter to prevent it with a systemic fungicide three times each summer if you don’t want to get damage from the disease. It generally does not kill the turf, but the circles of ugly will remain until fall if not treated. Cultural Control – Back off on quick release nitrogen! Lawns that are juicy green going into the summer are usually fertilized with large amounts of quick release nitrogen. Succulent, dark green leaves are soft and easy for the fungus to penetrate. Therefore, we switch to organic, balanced fertilization during the summer and back off of the deep green we maintain in spring. Water deeply and infrequently. The number one mistake homeowners make is to water their lawns when air temps are above 75 degrees. Remember, leaf, NOT soil moisture is the main ingredient needed for fungus development. If humidity is really high, that alone is enough moisture alone to ignite the fungus. General mis-information: “I never got “Brown Patch” when I had weeds, bermuda, and other stuff in my lawn”. I have heard this many times, and it is true. It is not natural to grow a mono stand of cool season grasses, with no weeds and keep it green during high temps. Therefore, if you stop fertilizing, let the weeds and bermuda take over, and generally let nature put what nature wants in your lawn, you will never have a “Brown Patch” problem. However, most people reading this want nice looking lawns. It’s just part of the price we pay for trying to outsmart nature. “If we don’t fertilize, will we still get “Brown Patch”? Not as much, but your grass will be high yellow and “Dollar Spot” fungus will be your new problem. It attacks under fertilized turf. Then you will have ugly yellow turf with brown spots all in it. Helpful Info: “Can I treat it myself and save some money”? You can treat it yourself, but won’t save much money. There is only one granular fungicide that works for 28 days. PERIOD! That is Heritage granular fungicide. All the other granulars cost a little less, but only last 10-14days. You will have to use the cheaper ones twice to get full recovery. Heritage granular fungicide is availabe at the “vendors I like” section on right side of this page. Expect Heritage granular fungicide to cost a minimum of $6.00/1000sqft at the PREVENTATIVE rate. $12.00/1000sq ft at the curative rate.